Imagination and fancy raised Coleridge above the level of the physical. Comment. “It was agreed that my endeavours should be directed to persons and characters supernatural or at least romantic, yet so as to transfer from our inward nature a human interest and a semblance of truth sufficient to procure for these shadows of imagination that willing suspension of disbelief for the moment which constitutes poetic faith”. 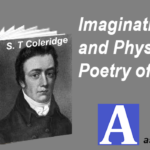 Indeed, Coleridge uses supernaturalism in his poems to create interest of the readers. In fact, these elements forces the reader to read whole poem and saves him from boredom. Perhaps, it is the only weapon, due to which, S. T. Coleridge is being appreciated in the history of English Literature. He has skills to use this technique in his poems. It is evident from his poem “The Rime of Ancient Mariner” that he is skillful sketcher of supernaturalism. In addition to “Ancient Mariner”, “Christable” and “Kubla Khan” also reveal the skills of poet in this regard. Though they are incomplete yet they are impressive and interesting. In these poems, especially, in “Ancient Mariner”, the sea, the landscapes, the mountains, the characters and also the animals are very skillfully supernaturalized by the poet. Although, S. T. Coleridge did not introduce the technique of supernaturalism yet he made improvements in it. Due to his efforts, the lovers of literature acknowledged the importance of supernaturalism. Before Coleridge, Horace Walpole Mrs. Radcliffe and Monk Lewis tried their best to use supernaturalism in romantic poetry but only S. T. Coleridge got fame in this regard. These elements of supernaturalism increases the sight of readers. It expands their imagination and forces them to see above the level of naturalism.Readers believe the unbelievable and forcibly convinces their minds to believe on the imaginative realism of the poem. Hence, Coleridge’s supernaturalism talks about the possibility and probability. It shows the reader that anything can be possible if we have faith on it, therefore, the poet’s supernaturalism hits the rule of physics and does not controvert it. Obviously, S. T. Coleridge, sometimes, introduces ghosts as characters but his efforts are not deniable. The very idea of presenting ghosts like characters touches the human interest and reduces boredom.When, in “Ancient Mariner”, he writes: “Alone, alone, all, all alone” “Alone on a wide wide sea!”, it is definitely supernatural experience as it is consciousness of guilt yet this is what “dramatic probability” is. Factually, “Ancient Mariner” is dramatic poem and it becomes dramatic because of supernatural elements. Coleridge remains true to nature. His sets up such scenes, which always remain close to nature. In simple words, his supernaturalism can be defined as the personification of natural forces and its related objects.In addition to it, he blends natural elements and supernatural elements. The hotchpotch of these two ingredients leaves such a mark on the minds of readers that they cannot stop themselves to praise S. T. Coleridge.